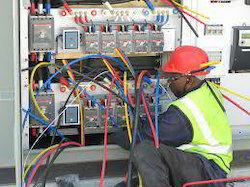 We are one of the leading service providers of optimum quality Laying of Cable Electrical Poles . These services are rendered by highly skilled and experienced designers and technicians so as to provide the desired results to the customers. Founded in the year 2013 at Vadodara (Gujarat, India), we “R. R. Electricals” are a Partnership firm, engaged in providing qualitative services like Industrial Electrical Services, Industrial Electrical Work, Industrial Wiring Service, Residential Electrical Service, Food Industry Electrical Work, HT Cable Work, LT Cable Work, Low Voltage Work, etc. The provided services are highly cherished in the market by our clients owing to their promptness, reliability, flawlessness and on-time execution. Under the able guidance of “Mr. Ronak Patel" (Partner), we have attained an outstanding position in this industry.